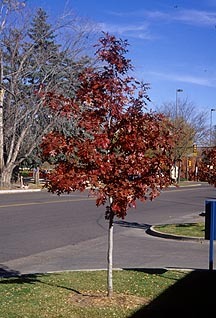 This tree in Colorado Difficulty in identifying members of the red oak group have limited demand and production of Shumard oak. This oak has excellent potential for use throughout Colorado. Colorado growers should begin production from acorns produced by mature trees found in the Denver area. 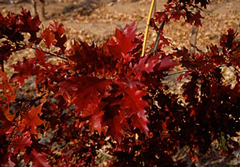 Selecting a western seed source is important in producing Shumard oak adapted to Colorado.The outstanding deep crimson-red fall color produced by the Shumard Oak is an excellent reason to plant this species. Peak fall color occurs around Nevember 1st in the Fort Collins area. In other urban areas, this tree has been embraced as a hardy city species. 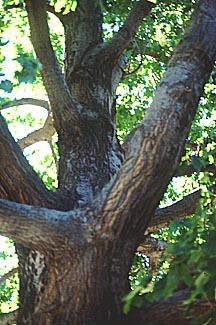 It is also a valuable lumber oak. Growth rate 40′ to 60′, medium growth rate. Foliage Deciduous, alternate, simple, 4″ to 6″ long, 3″ to 4″ wide, usually with 7 lobes. Leathery, lustrous dark green leaves turn red, russet-red, or yellow-bronze in fall. Buds A good way to distinguish Shumard oak from other members of the red oak group is the bud color that is light brown to gray, but never red or red-brown. Fruit The acorns are fairly large at 3/4″ to 1″ inch in length and are enclosed 1/4 to 1/3 by the cap. Bark Gray and smooth, becoming gray-brown, rough, with vertical furrows. Landscape value humard Oak is very tolerant to high pH soils. 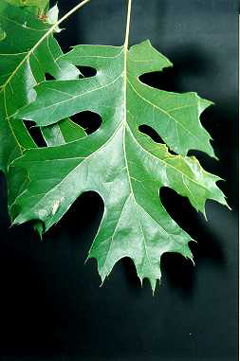 In soils where northern Red Oak develops chlorosis, Shumard will perform without micronutrient deficiencies. Chlorosis has seldom been reported in this species, even in soils with pH above 7.5. Considered a drought tolerant species and relatively easy to transplant.